Gordon Ramsay shows the owners of Fiesta Sunrise the mangy taped up cover of the old menu (which itself was recycled from Vic’s first failed restaurant called Fiesta Garibaldi). They dutifully frown and shake their heads No. Good thing because psych! This is the new cover haha. 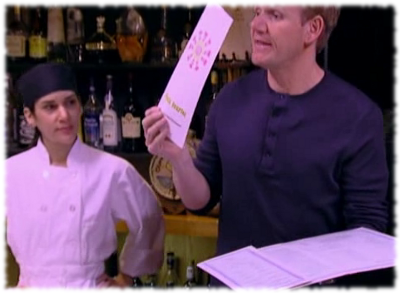 Gordon Ramsay opens the old menu to reveal a crisp white new menu that’s 100% tape free. Julieta looks like she can’t believe restaurant owners would need such remedial instruction. This entry was posted in Season 2 and tagged Fiesta Sunrise, Gordon Ramsay, Kitchen Nightmares. Bookmark the permalink. Want More Scenes From Kitchen Nightmares? Hi my name is Anita and I'm setting out to watch every episode of Gordon Ramsay's Kitchen Nightmares. This blog is dedicated to posting about the funniest, craziest, or otherwise interesting scenes that I come across. Hope you like it and feel free to comment with your own reactions or favorite scenes!